Imogen's Typewriter. : My Quiet Re-Read-a-thon TBR! First, We all know I adore Lexicon by Max Barry*. I love it. I love love love it. But I've never re-read it and after being let down by Jennifer Government, I'm wondering if Lexicon will hold up two years later. I hope so. Next it's everyone's favourite re-read! It's Harry Potter and the Philosopher's Stone! Or Sorcerer's Stone if you're wrong. I'll be honest, the main reason I want to re-read this one is because when I read it with my friend I went a little overboard with the sticky notes to the point where I'd basically be re-reading it anyway trying to get them all out. Another book I loved when I originally read it was The Three by Sarah Lotz**. The mark of a good book is the way it resonates with you and I still think about this book. The working title of my novel is The Six (don't sue me please, I will change it eventually) because it made sense and a minute later I was kicking myself at the obvious influence. 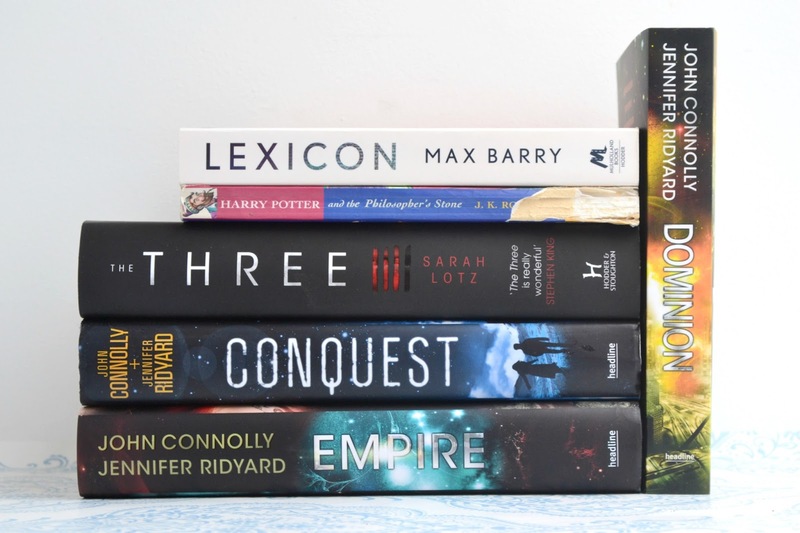 However, there are only two books I am absolutely definitely going to re-read in this re-read-a-thon and those are Conquest and Empire by Jennifer Ridyard & John Connolly**. I've been in love with this series since it was first published but I haven't got around to reading the third and final book, Dominion, yet. Why? Because I want to re-read Conquest and Empire. Why haven't I done that? Because I don't want this series to be over! I'm not ready! But like a sign, the Quiet Re-Read-a-thon popped up on my Bloglovin' feed and it's time. I can do it. Are you joining the Quiet Re-Read-a-Thon? What are you going to read? *I won this book on Goodreads! ** I was sent these books for review! I then went out and bought a hardcover copy of Conquest because I loved it so much.